As thoughts turn toward spring, many of us are looking forward to detoxing, and even though it’s still fireside weather we can start right now, curled up with a nice cuppa green tea. The “mama-san” of healthy beverages, green tea is something that we’ve all picked up on by osmosis, if nothing else. There is a general, uncontested acceptance of the stuff. But is it really a magic bullet? How does it work, and what are its benefits, both claimed and proven? And, last but not least, how do you make the perfect cup of tea? The desired benefits of drinking tea might go deeper than a simple detox. What if we are up against an adversary like cancer? How might green tea take on something that serious? A chemistry lesson is the best way to begin. All tea, not just green, comes from the leaf of the camellia sinensis plant. It is through the natural oxidation process after harvesting that the different types of tea emerge. While black tea is produced from leaves that are wilted, bruised, rolled, and fully oxidized, its more virginal sibling is made from unwilted leaves that are not oxidized. 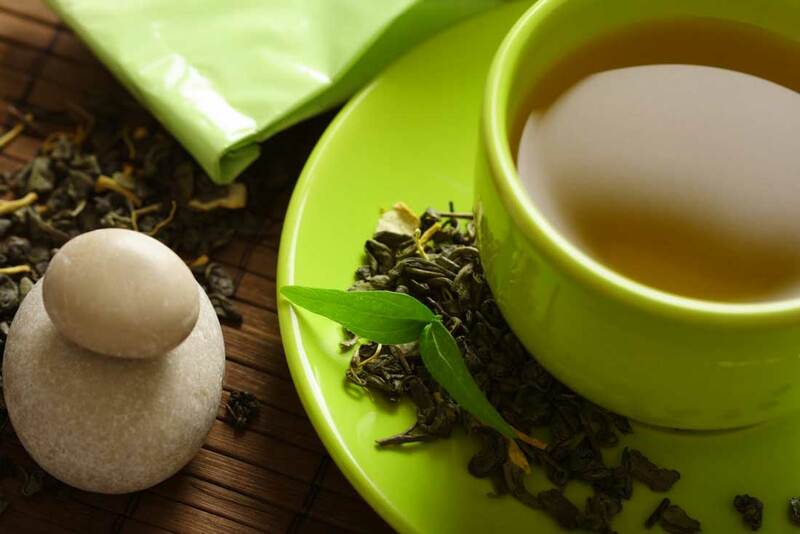 All tea contains polyphenol antioxidants, however green tea has the largest concentration of the polyphenol catechin known as epigallocatechin-3-gallate (EGCG). This particular antioxidant has been tested under the auspices of the The National Center for Complementary and Integrative Health, the federal government’s lead agency for scientific research on complementary and integrative health approaches. EGCG shows to be the most effective antioxidant for eliminating free radicals (organic molecules responsible for aging, tissue damage, and possibly some diseases such as cancer). Sounds pretty convincing despite the inevitable disclaimer that comes with all new studies such as this one. But clinical research focused on green tea and disease has been going on for a long time by some very impressive medical institutions worldwide. In a double-blind, placebo-controlled study, 60 men took 200 mg of green tea catechin or a placebo three times daily for 1 year. These men had high-grade prostatic intraepithelial neoplasia, which is thought to be a precursor of prostate cancer. After 1 year, fewer prostate cancers were detected in the green tea catechin group (1 cancer in 30 men) compared with the placebo group (9 cancers in 30 men). Predating modern studies by 4,000 years, green tea was used by traditional medicine practitioners in China to boost alertness, relieve headaches, help digestion, reduce heat, and more. Japanese Zen monk Eisai visited China in the 12th century and is credited with the beginning of the tea tradition in Japan, as well as writing the book The Kissa Yojoki (The Tea Drinking Cure). Nowadays we can google and find dozens of blogposts and articles on the medicinal benefits of green tea. Its popularity has given the average American consumer exactly what we have come to expect: too many product choices, and background information that is either insufficient (on the label) or overwhelming (on the internet). We grab a Diet Snapple Green Tea or a Lipton green tea bag and think (or hope) we’re getting all the health benefits we associate with it. In many instances, we’re not. Not only do bottled green tea drinks not have the concentration of antioxidants a brewed cup has, they contain flavorings, sweeteners, and often times, preservatives. Tea bags are made with dried-out, leftover tea dust from the loose leaf, and the bags themselves may have a carcinogenic coating. So much for that. The Japanese have turned the art of drinking tea into a ceremony. At the very least we can slow down and learn how to make and enjoy a real cup of tea. Jonathan Peizer, owner of Long Island-based Green Tea Lovers: Your Virtual Green Tea House, is a walking encyclopedia of his product, and has some tips for making the perfect cup of green tea. Begin with loose tea. Next, bring filtered water to a boil, then cool it down to 190 degrees (there are appliances just for this purpose). “The leaves are very sensitive, and making the mistake of pouring boiling water over them just burns them. Steep only for about 30-40 seconds or you will get a marshy taste,” he warns. Boiling water draws out the tannins and causes bitterness. The proper temperature pulls out the sweetness, caused by amino acids. You can reuse the leaves for a second and third infusion, fine-tuning the taste to your liking. Adding milk or honey is a no-no, but the vitamin c in a bit of lemon juice helps activate the antioxidants. “Ideally, you will only want to taste the tea itself,” he concludes. It turns out I have been doing everything wrong. I look forward to the beginning of March, when thoughts lean to green. A new season, a new attitude, and a new knowledge–all sound like the perfect detox mix.